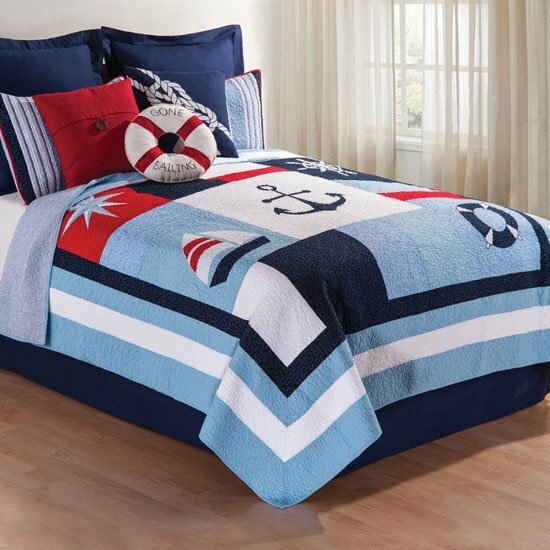 Noah nautical quilt bedding by C&F Enterprises | P.C. Fallon Co.
Lowest prices all the time, guaranteed! If you find a better price, let us know. Noah Quilt bedding by C & F Enterprises lets you set sail without ever leaving shore. The patchwork pattern has bold blocks of white, red, navy, and light blue with some of the blocks featuring appliqued or embroidered nautical symbols including an anchor, a ship's wheel, a sailboat, and a compass. Blocks of stripes add more interest. The quilt is framed in bands of navy, light blue, and white finished with light blue binding trim at the edges. Quilt reverses to a blue and white mini check. The sham has a two tone blue and white stripe center block accented by an embroidered navy ship's wheel, and it is edged with a white band and a light blue band. A tailored navy bedskirt and navy euro shams form a crisp backdrop for the quilt and shams. Add accents with a red throw pillow, a life preserver pillow, and a rope knot pillow. 100% cotton and machine washable on gentle. Pillows are spot clean only. NOTE: Due to the size, all nautical emblems may not appear on the twin size. The Noah Twin Quilt has bold patchwork blocks of white, red, navy, and light blue with some of the blocks featuring nautical symbols including an anchor, a ship's wheel, a sailboat, and a compass. Blocks of stripes add more interest. The quilt is framed in bands of navy, light blue, and white finished with light blue binding trim at the edges. Quilt reverses to a blue and white mini check. 66"W x 86"L. We offer the complete ensemble in the Noah pattern by C & F. Manufacturer's UPC code is 008246332886. NOTE: Due to the size, all nautical emblems may not appear on the twin size. The Noah King Quilt has bold patchwork blocks of white, red, navy, and light blue with some of the blocks featuring nautical symbols including an anchor, a ship's wheel, a sailboat, and a compass. Blocks of stripes add more interest. The quilt is framed in bands of navy, light blue, and white finished with light blue binding trim at the edges. Quilt reverses to a blue and white mini check. 108"W x 92"L. We offer the complete ensemble in the Noah pattern by C & F. Manufacturer's UPC code is 008246332893. Red Feather Down Pillow with brown button accent. Feather down filled. 18" x 18".